Wow, its Friday, where the heck did the week go? I don't know about everyone else but it flew by for me! I am definitely ready for the weekend! 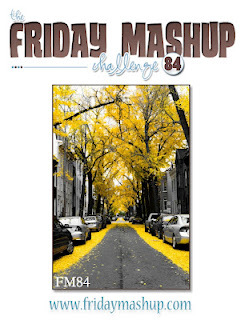 Today at the Friday Mashup we have a great challenge for you, brought to us by Holly. I just love the photo she chose for the graphic, isn't it stunning? For the challenge she wants us to use dry embossing, make a project that uses the colors Daffodil Delight, Basic Gray and Basic Black OR mash it up and create a project with embossing and those colors. I love to dry emboss and I love those colors so I mashed it up this week. Hold on to your seat because ((gasp)) I didn't make a Christmas card! I seriously thought about it, because these colors would definitely be interesting and out of the box but in the end I brought out a set from the holiday catalog I hadn't used yet, Friendship Preserves. The main image is stamped in Basic Gray and matted on Daffodil Delight and Basic Black. 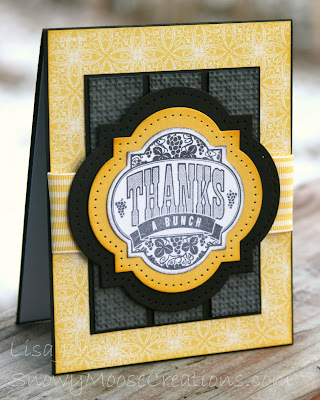 The panel behind it is Basic Gray embossed with the square lattice folder and layered on more Basic Black card stock. I did paper piercing around the labels to draw the eye in some more. Head on over to the Friday Mashup blog to check out all the great projects from the rest of the design team, and I hope you play along with us! Love your card Lisa and you used two of my favorite color combos. LOVE! Such a pretty use of the colours, and the layout is awesome! This is such a strikingly beautiful card! I love the layers of labels and the embossing! I'm so proud of you... that you didn't make a Christmas card! I love this layout and color combo with the stamp set!! Fabulous card Lisa! Love the layout you've used, and that layered label is the perfect focal point! Another great creation Lisa! Love that stamp set and you did a great job combining the colors .